This entry was posted in Sports and tagged basketball, Chuck Cooper, Earl Lloyd, first African-American in NBA, Sweetwater Clifton. Bookmark the permalink. In February of 1948, the Harlem Globetrotters played an exhibition game against George Mikan and the Lakers in front of 20,000 people in Chicago. Barring a couple of dribbling routines, this was a serious basketball game. Much like the crossover barnstorming tours in baseball, this exhibition was a wakeup call to the NBA (NBL at the time), that basketball was not just a white man’s game. The Globetrotters won that game 61-59. 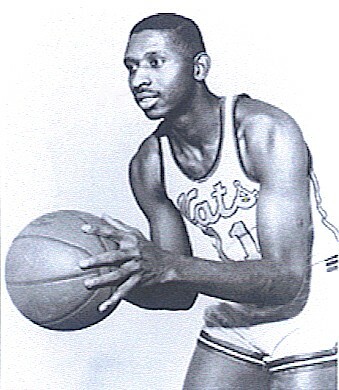 Two years later, Nat “Sweetwater” Clifton would be the first African American to sign with an NBA team after his contract was purchased from – wait for it – the Harlem Globetrotters. Thanks for your comment, Brian. One can’t help but wonder what the athletic “Sweetwater” Clifton might accomplish if he was a current player, with the up-tempo style that is now popular. Back then, it was common strategy to get a lead and then freeze the ball. There was a game between Fort Wayne and Minneapolis in 1950 (Clifton’s first year) that had a final score of 19-18. The 24-second clock was introduced in the 1954-55 season — it’s probably not a coincidence that his best years came after that. Any of you reading the above two comments now have some idea what dinner conversations were like in our home. The name Chicago Lakers makes sense? LA Lakers? Not at all. The relocation of teams created some odd combinations. When the New Orleans franchise moved to Salt Lake City, the team became known as the Utah Jazz. I don’t know about you, but I don’t associate Utah with a thriving jazz music scene. There are pictures of quilts next to each comment, Mom. Those are for you. its a huge percentage of African-American in team.